Feeling Captain Kirk-like lately? Forget the pressed vacuum-sealed uniform in your closet (yes, we know you have one) and go for this new bathrobe instead. There are three of them to choose from, in fact. Red, blue, and gold for each unit in the USS Enterprise. There’s also a shortened ‘skirt’ version of Uhura suitable for the women. 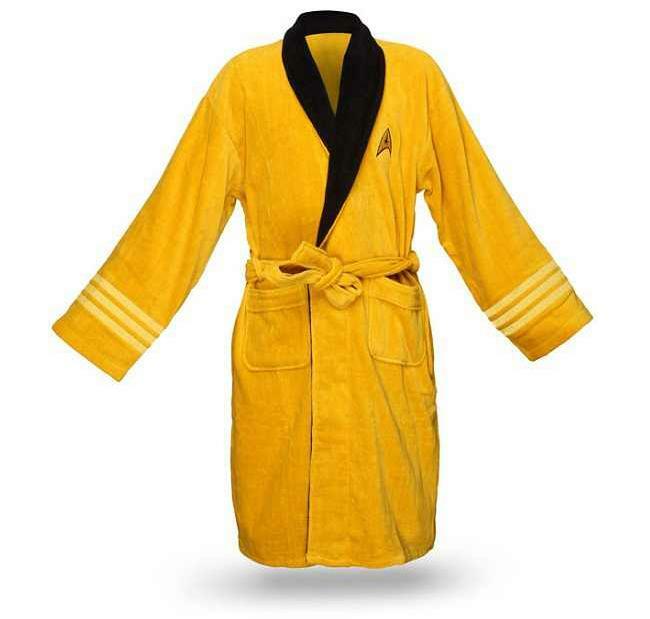 These new bathrobes take after classic Star Trek, of course, and are 100% cotton. They don’t come with matching flip flops though. Unfortunately, when it comes to features, other than comfort and a couple of pockets there’s little else worth mentioning. There’s a whole chunk of cheeky product related text over at the site however, so check it out. It’s heaps of fun. Each robe sells for $59.99 but can go as low as an easier $39.99.